Week with lowest return = half of July with 3.70% distributed. These are excellent results for a risky investment site, but that will stay sustainable thanks to the commitment of the administrator. A site that continues to grow visibly, you just have to see the users statistics and registration of new members. Hopefully 2019 will continue like this, if it does not improve by me it can stay at this level that is already very profitable and safe! Today was the day to ask for the 4th payment at Diversity and it already arrived in my wallet! Another DP25 package has expired = another DP25 package that I have repurchased! I decided to buy another DP50 before asking for a new payment! Today marks 1 year since I joined Diversity Fund but I would liked to say that it was 2 or 3 years ago (the site opened in October 2016), so happy that I am. 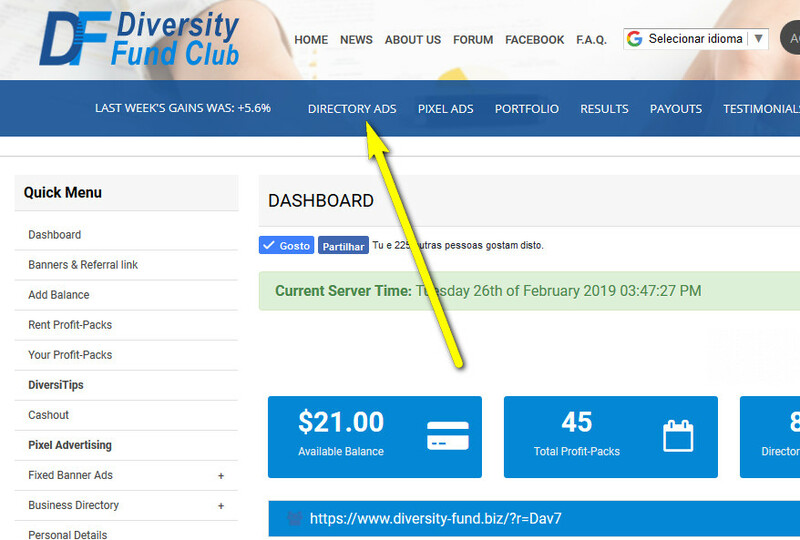 It has been a long time since I found an investment site as stable as this, with a realistic administrator who does not want to have the best website in the world but rather a well-structured site with balanced finances. At this time I have been able to recover the investment while I have had long periods of 100% reinvestment to grow the account. There's no problem with DFC website, we don't want you to be scared! If you look at the address bar of your browser, you can see that https:// has been set instead of http://. We have renewed our SSL certificate and there is a small bug that only affects the design of the website. We are already working to fix the bug and soon old design will be visible again. We ask for your patience. (You can enter your accounts now but look strange.) "
The site has already paid members $ 3,289 just for ad clicks, which is equivalent to 82,250 clicks since 2016! That's why you should not neglect this section of earnings on the site if you want to see your balance go up day by day. While we wait for the results of the last week of February to close the month, have you noticed that two weeks ago we had the highest percentage of earnings this year? We received 5.7%, very close to the highest percentage paid last year which was 6.1% in April. 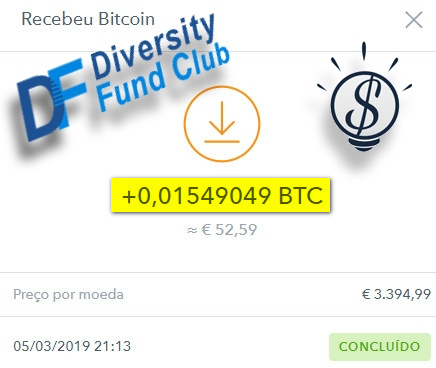 On the day I received the 5th payment of this investiment site, I also made de balance of the gains for the month of February.
? The payment was 0.0155 btc worth € 52.29 on arrival in the Coinbase wallet. It was an unplanned payment to help a referral who needed Bitcoin to also invest in the site. Now I'm going to reinvest 100% until I get to the 10 DP50 packages.
? As for the balance sheet, the month closed with an average return of 5.6%. During the month the highest weekly percentage of this year was reached, when we received 5.7% in the second week. Normal and stable gains as we want! I just noticed now that last week (03.04.2019 - 03.10.2019), the site repeated the best mark of this year with a distribution percentage of 5.7%. I continue to repurchase DP25 packages that have expired and accumulate balance to be able to buy the 9th DP50 package. I have finally reached the 10 DP50 packages thanks to 100% reinvestment in recent weeks. Still far from reaching the maximum of 50 packages but with these 30 I am already receiving a good daily return. We hit again this year's record at 5.80% in the last week of the month.
? The month ended with an average percentage of 5.70%.